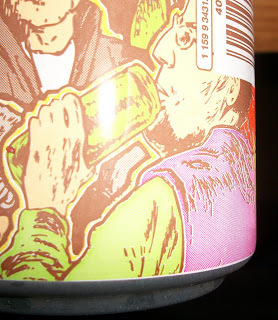 Hey, did you know I also reviewed Peace Tea Ceylon, Green Tea, and Razzleberry? You should probably check 'em out. Oh goodie goodie gumdrops! 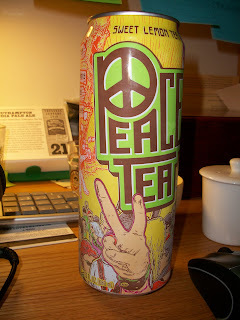 It's time for another Peace Tea Rorschach test! 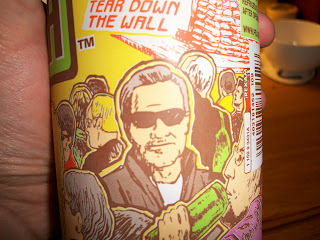 Interpreting what the drawings on the can are is half the fun of this beverage. The other half is the fact that it's actually decent for 99 cents and it uses real sugar. But first, the pictures. This little guy kinda reminds me of either an oddly shaped, semi-humanoid Muppet (think a young Waldorf) or Danny from The Shining after a few "special" brownies. Yeesh. Next up? That's right, ladies and gentlemen. Charles. Bronson. Promoting from beyond the grave. 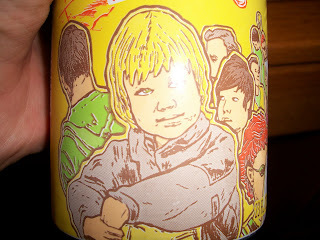 Good gravy, I love these damn cans. As for the tea, who the hell cares? No no, I kid. It's not too bad. The sucralose flavor is pretty much masked by the lemon flavor which doesn't taste completely natural but also doesn't taste like watered down Pledge either. Honestly, I would recommend these more for the can than what's inside. Which, I'm sure, will make my friend Ryan very, very happy. best tea in the WORLD! i made a pyramid of the cans in my bedroom!